Citizens and residents of the UAE actively participated in the UAE National Sports Day celebrations from 8am until 9pm on March 7 at over 175 locations. Supported by the Dubai Sports Council (DSC), UAE National Olympics Committee (UAE NOC), the Dubai Police, and the KHDA, Al Jalila Cultural Centre for Children along with local radio stations put together an entertaining and active event with an array of sports activities for children. To promote sports among the Emirati community, youngest Emirati rhythmic gymnast Lamia Tariq Malallah entertained the children by showcasing some of her gymnastic moves, while youth icon Hussain Yousuf Anwar, Emirati football player from Al Wasl club, showed his football prowess. 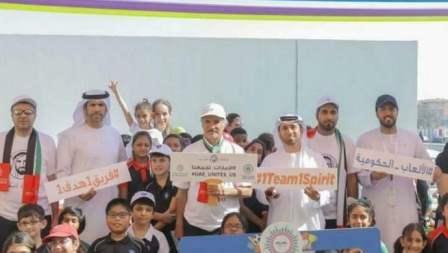 Saeed Hareb, secretary-general of the DSC, along with UAE NOC officials actively participated in the games to show that age is no bar to play sports and to encourage community members to participate in the event. Dr Abdulla Al Karam, director-general of the KHDA, said: "This year's UAE Sports Day is an exceptional event as it coincides with the Year of Zayed. We encourage the school community to come together and celebrate this day as we look back at the positive values left behind by late Sheikh Zayed bin Sultan Al Nahyan." Talking about the importance of promoting fitness among children, Saeed Hareb lauded the participation of Lamia and Hussain in the event. He stated that both are emerging Emirati athletes and will create more awareness for families to accept and introduce sports to their children as part of their daily discipline. "The UAE National Sports Day is a celebration of our efforts to unite people and this year we also celebrate the Year of Zayed - which makes the event even more special. The UAE sports day is an implementation of the directives of the wise leadership by making sports lifestyle, we celebrate each year," said Saeed Hareb. Lamia's mother, Malak Alfarsi said: "I think it is fantastic that different nationalities are participating in various events along with officials and ministries. Although we have sports day celebrations every year, this year the country has definitely scaled it up. Many sports activities were organised by schools, sports associations and education authorities in such a cohesive manner among various emirates for the first time. There were opportunities for the determined ones to showcase their skills." Managing director Mattar Bin Lahej and Hussein Alatoli from Al Jalila Cultural Centre extended their appreciation to all who participated and competed in unified harmony.